Kolkata Knight Riders 5-188 (Gautam Gambhir 44, Debabrata Das 43*, Roelof van der Merwe 2-18) beat Titans 89 (Jacques Rudolph 25, Henry Davids 13, Lakshmipathy Balaji 4-19) by 99 runs. Kolkata Knight Riders piled up 188 runs with five wickets remaining in the measured 20 overs and the innings of the Titans was folded back for just 89 runs in 16.4 overs. Debabrata Das (Kolkata Knight Riders) was declared ‘Player of the match’ for his thundering unbeaten knock of 43 off 19 balls. The Champions League Twenty20 – Group A match was played on Sunday, October 21, 2012, at Newlands, Cape Town. Earlier, Martin van Jaarsveld, the captain of Titans, won the toss and opted to go into fielding first. 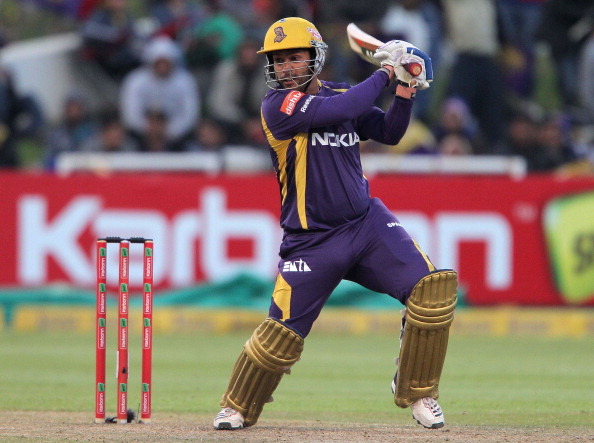 Manvinder Bisla initiated the innings with his skipper, Gautam Gambhir, and the first ball was sent out of the fence. Bisla started with the first boundary and hit a couple of lofty sixes and one four in the third over before he was gone for 27 off 14 balls with 2 sixes and 3 fours. The hard hitting, Brendon McCullum, associated next with Gambhir and the first got 10 runs two overs later with 1 six and 1 four. The duo started punishing the bowlers as Gambhir hit 3 fours in the sixth over and McCullum gathered 16 runs in the next over with 2 sixes and 1 four. The second wicket contributed a 63 quick fired runs in just 33 deliveries when Brendon McCullum was caught by Farhaan Behardien at long on off Cornelius de Villiers for 36 off just 20 balls with 3 huge sixes and even fours. The second wicket fell at 95 in 8.2 overs as Jacques Kallis became the next victim after adding 34 runs in the total for 18. The innings of Gautam Gambhir did not last longer and he was gone for 44 off 36 with 1 six and 4 fours. Kolkata Knight Riders reached 5-133 in 15.3 overs when Debabrata Das started his onslaught by smashing 1 six and 3 fours in the 18th over followed by 1 six and 4 fours in the next two overs. He remained unbeaten for 43 off 19 with 2 mighty sixes and 6 splendid fours as Kolkata Knight Riders stewed 188 for the loss of five wickets in 20 overs. Martin van Jaarsveld was the top wicket taker with two whereas Ethy Mbhalati, Cornelius de Villiers and David Wiese shared one wicket each. The Titans began their innings reasonably well with Henry Davids along with Jacques Rudolph and accumulated 24 runs in three overs. Davids was clean bowled by Jacques Kallis for 13 as Heino Kuhn joined with Rudolph. The pair tried to construct the innings with caution and crawled to 51 in 7.4 overs. The stumps of Kuhn were destroyed by Lakshmipathy Balaji for 10 at that particular score. That was the beginning of a tragedy for the Titans as the rival bowlers got command of the situation. Jacques Rudolph was the fourth batsman who was directed towards the pavilion for 25 off 24 with 2 fours and his team was reeling at 4-51 in 8.1 overs. The wickets of Titans fell like ninepins and eight of their batsmen were unable to enter the double figures against the hostile bowling spell of KKR. The entire team was bowled out for mere 89 runs with 20 balls to spare. Lakshmipathy Balaji was the most threatening bowler and grabbed four wickets for just 19 runs. Iqbal Abdulla and Manoj Tiwary held two wickets each whereas Jacques Kallis and Sunil Narine shared one wicket each. Kolkata Knight Riders won the game majestically by a giant margin of 99 runs and earned six points from four games but found themselves out of the tournament. The Titans have secured 8 points from 3 matches and the field is wide open for Auckland Aces as well who carry 6 points with one game still to be played by them.